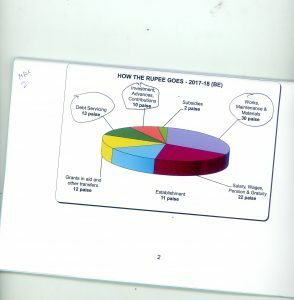 Just as the Bharatiya Janata Party (BJP) insisted that its 13 seats in the 40 member Goa Assembly were higher than the 17 seats the Congress secured, Finance Minister Manohar Parrikar resorted to Vedic maths and presented a budget that converted a financial deficit or fiscal deficit of almost `2,000 crore into a surplus of `200 crore for the year 2017-18. Despite the state groaning under a debt of over `12,000 crore, Parrikar has increased the budget of the Public Waste Department to make his alliance partner Sudin Dhavalikar happy. FORMER Defence Minister and present Chief Minister Manohar Parrikar has proved himself to be a master of golmaal not only in the case of politics, but in presenting his budget too. Staking a claim to form the government, Parrikar managed to convince the governor, Mridula Sinha, that 13 was greater than 17. This is a reference to the fact that since the Congress had emerged as the largest single party in the 2012 Assembly elections, the governor should have invited the leader of the Congress Legislative Party to attempt to form the government. But whether it is in Manipur or Goa, in which states the Congress had secured more seats than the Bharatiya Janata Party (BJP), it resorted to by Vedic maths where 13 can be greater than 17. The justification of course was that the vote share of the BJP in Goa was higher, though this was not true in the case of Manipur. In both cases the BJP bullied or bribed smaller parties to extend support to it so as to be able to form the government. THE budget presented by Parrikar on Friday March 24, 2017, shows the BJP genius for Vedic maths under which huge deficits can overnight be transformed into surpluses. Just the day before, the new chief minister, who is also the finance minister, presented the Economic Survey for the year 2016-2017. The Economic Survey admitted that the total receipts for the year 2016-17 (revenue + capital) amounted to `13,111.19 crore. The fiscal deficit was estimated to be minus `2,001.84 crore. Despite this, Parrikar managed to present a revenue surplus budget of `202.48 crore for the year 2017-18. He has projected revenue receipts of `10,872.63 crore and revenue expenditure of `10,670 crore. The gross budget size for the year 2017-18 has been projected at `16,027.01 crore as against `14,694.17 crore in 2016-17, an increase of 9.07 per cent. This is very commendable indeed. But I’d like to ask Mr Parrikar from where the funds are going to come. With the taxes currently proposed, even if one takes into account the increase in the VAT on petrol to 15 per cent – a dramatic u-turn over Parrikar first budget in 2012 – the numbers do not add up. Unless of course you resort to Vedic maths where less is more. STATIC: Growth has been stagnant or even declined, as only 10% of the budget goes into investment in new job-creating projects. Of the total revenue, 13% goes towards just paying the interest on the loans of the government. Presumably Parrikar is expecting the Narendra Modi government at the Centre to extend financial assistance to help bridge the gap between the state’s own revenue and the extravagant expenditure it has incurred. The Union minister for transport Nitin Gadkari has been very generous to Goa as admitted by Parrikar as the Ministry of Road, Transport and Highways has sanctioned projects worth `11,000 crore for Goa. This will unfortunately include the development of national highways and bridges where the Supreme Court has directed that no daaru can be served. So what is so generously offered by the Union Transport Minister will be taken away by the Supreme Court as the ban on daaru within 500 metres of the national highway will results in steep fall in the income from VAT on daaru. As the table No 4.3 of the Economic Survey for the year points out the States own tax collection which was `2,939.66 crore in 2012-13 rose to `3,895.92 crore in 2014-15. The revised estimate for 2015-16, which is the actual collection, is `4,033.74 crore. The projection of the budget estimate for 2016-17 is `4,916 crore. On what basis has the Finance Minister assumed revenue of `4,916 crore for 2016-17 when the revised estimates for 2015-16 was only `4,033 crore? Where will the additional `900 crore comes from? The bulk of the state revenue comes from VAT which is likely to be discontinued from July when the General Sales Tax regime comes into place. On what basis then has the Finance Minister made projections of Revenue for the year 2017-18? OF THE non-tax revenue of the state, sales of power contributed `407.75 crore in 2016-17, water supply contributed `162.62 crore and others, referring primarily to service taxes, contributed the bulk of `961 crore. Mind you these are estimates and it has been acknowledged that due to demonetisation there has been a sharp drop in service taxes particularly in non-formal industry and in tourism, because people did not have the liquid cash to pay. 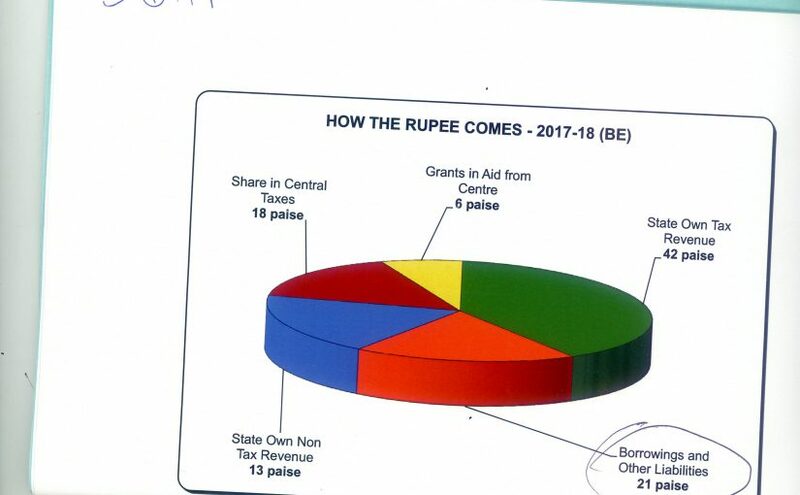 So much so, that the actual revenue from the states own non-tax sources, particularly services which contributed `961.13 crore of the `1,531.50 crore, is likely to fall far short of the budget. The problem with Parrikar is that he likes to throw money around and spent lavishly without thinking about where the funds will come from. Which is why in the first budget he presented when he returned as chief minister in 2012, he made the grand gesture of virtually abolishing the VAT on petrol. Parrikar also announced a number of populist welfare schemes such as the Laadli Laxmi and Griha Adhaar schemes under which housewives were given a inflation allowance which kept increasing with every budget. Parrikar also raised pensions under old age pension schemes. All this cost the government crores of rupees a month and became a big drain on the treasury. The burden has become even bigger with the state implementing the 7th pay commission under which even a driver will get a minimum starting salary of `40,000 per month. Not surprisingly, bribes being demanded for government jobs have also gone up proportionately. But Parrikar’s passion was not social welfare schemes but the building of bridges. It was Parrikar who had started work on the third Mandovi bridge. In his latest budget Parrikar has promised to complete the new Mandovi bridge the new Amona Virdu bridge, the Tambudki bridge at Arpora-Baga and the grade separator at Dabolim. This is of course besides the fancy Zuari bridge, which fortunately will be financed by the centre. During the tenure of the BJP in government between 2012 and 2017 the capital expenditure mainly on bridges and on stupid projects like concretising the Dona Paula bypass road increased from `1,285.11 crore in 2012-13 to `3,354.46 crore in 2015-16. The budget estimate for 2016-17 puts the capital expenditure at `3,908 crore. In his budget for 2017-18 Parrikar has increased the Public Works Department budget by 40 per cent to `1,982 crore to keep the greedy PWD Minister Sudhin Dhavalikar happy and to reward him for his support. The consequence of the mindless spending by the BJP government under Parrikar, and subsequently Laxmikant Parsekar, is a huge increase in the public debt. The public debt of the state has gone up by more than 400 per cent from `4,217.52 crore to an estimated `13,000 crore in the year 2016-17. As on March 31, 2017, the public debt is estimated by the Economic Survey conservatively to touch `12,018.86 crore as against `10,945.38 crore during March 2016, registering an increase of `103.17 crore over just one year, a debt burden of `12,000 on every Goan. The unfortunate part of the public debt of the state is that a lot of it has been taken from the market at high rates of interest to fund infra-structure projects entrusted to the Goa State Infrastructure Development Corporation (GSIDC) which have witnessed steep escalation in cost. While central loans to the state have fallen from `53.53 crore in 2012 to `35.09 crore in 2017, market based loans have increased more than 300 per cent from `2,761.18 crore in 2012 to `7,142.49 crore in 2017. Which is why the total public debt has gone up from `6,872.36 crore in 2012, to more than `12,000 crore in 2017. According to the Economic Survey during the years 2012-13 and 2013-14, the revenue deficits of the State was `215.92 crore and `353.51 crore. Fiscal and primary deficit of the state has shown an increasing trend. The fiscal deficit which was `1,137.36 crore in 2012-13 increased to `1,369.87 crore in 2013-14. The reduction happened due to a shortfall in excise from `315.21 crore in 2015-16 to `221.80 crore in 2016-17 up to January. In the case of transport the decline was from `223.27 crore to `198.22 crore. The biggest decline was in terms of non-tax revenue such as sales of power which came down from `175.05 crore in 2015-16 to `117.59 crore in 2016-17. The Economic Survey admits that the revenue deficit in 2015-16 was `137 crore. The fiscal deficit was `1,958 crore which is the gap between the taxes expected to be collected and the actual taxes which were paid. The primary surplus in 2015-16 according to revised estimates was `882.44 crore, which is why it is all the more strange that in his budget for 2017-18 Parrikar has projected surplus revenue of `202.48 crore. ADMITTEDLY the chief minister and the BJP have had some bad luck. Almost immediately after he returned to power in 2012, the Supreme Court completely suspended all mining activity. This caused a huge loss of revenue to the state which was compounded by the generous packages which were offered to those who were rendered unemployed due to suspension of mining. What the mining industry should have done, the government took on its head to keep the mining area MLAs and voters happy. It must also be admitted that there was major losses in revenue due to the suspension of the VAT on petrol which was restored partially by Parsekar and now almost fully by Parrikar. But then Parrikar has never been known to cut his coat or rather his shirt according to the cloth available, which is why though mining has revived, he does not want to take any chances as the price of ore is down to the lowest level. The ecology lobby may still put obstacles, so Parrikar is relying on casinos for the major part of the income to finance his dreams of making Panjim and Goa a paradise on earth. In the process the real wealth of Goa which is all the greenery and the mangroves will be ruthlessly destroyed.